For those of you who don’t recognise the shape it’s a Triumph Spitfire 1500. It was registered in October 1975, and I owned it from July 1998 until April 2002. During that time I had a fair bit of maintenance work done – the most obvious being a respray from White to Carmine Red along with a full restoration of the body work. I’ve included some history about my old Triumph Spitfire – including details of the extensive bodywork restoration and some photographs. Have some fun with the Triumph Spitfire colour chart and other interactive bits. 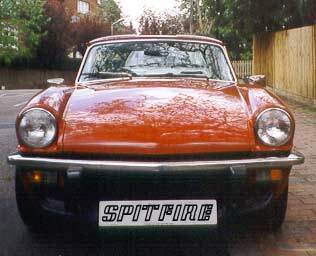 There are Triumph Spitfire production dates, a Triumph Spitfire links page, a section on my Spitfire’s fuel consumption and a Triumph Spitfire hints and tips page. This site is a member of the Triumph MotoRing – a web ring containing links to many sites carrying information about Triumph cars and their owners. You can use the links here to navigate the ring or to join it if you have a site of interest to other Triumph owners.